Robert A. Makley is a photographer whose work reflects a life-long interest in using the photographic medium to capture moments in time. His earliest exposure to photography was in his father’s basement darkroom; he went on to pursue a career in law enforcement, receiving formal training as an evidence technician specializing photographic evidence collection. 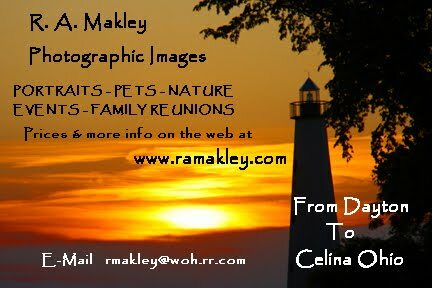 Now retired from law enforcement, Robert A. Makley continues to explore the photographic medium by doing portraits, events, pet photography, nature and scenic images. During his career as a Ranger with Five Rivers Metro Parks, he provided images of the parks, park patrons, and employees for promotional materials and advertisements – a relationship that continues today. He provide's the photographs for numerous website's, and works with the American Veterans Heritage Center at the Dayton VA. He has won multiple awards, including the Award of Excellence from Photographers Forum Magazine, the TDN Publications Certificate of Artist Achievement, and the TDN Publications Award of Merit. Throughout his career as a photographer, he has focused on finding images that are emotionally resonant as well as beautiful. The variety of his subjects is compelling – from nature photography to photographs that highlight the beauty of urban landscapes, as well as images that focus the viewer on the human element involved in public service and the contributions of our veterans’ military service. In photographs that highlight the variety of human experience, Robert A. Makley’s work seeks to do what photographers have done nearly two centuries: to freeze a moment in time, to document the beauty of a scene or capture history as it occurs. Available to come to your site for photographic session's. For $40 per hour (minimum of 2 hours) you will receive a DVD with all images taken during your session. You have full use of all images. H Contact me at rmakley@woh.rr.com. for further info. All images are for sale (with the exception of Veteran and Law Enforcement images) Price per image listed below. One time use in publication or web page $80.00 I own image. All rights to image $500.00 You own image.